McDonald’s and Burger King. Coca-Cola and Pepsi. Leafs and Habs. The world is full of iconic rivalries that exist from staunch loyalties and ideologies towards lifestyle and quality – but few can hold a candle to the rivalry between Ford and Chevy and their full size pickup trucks. Staples of the Canadian highway, both trucks are in a constant state of pendulum-style back-and-forth. Always managing to find a way to one-up the other regarding capability, power, and more recently, fuel economy. You know where our allegiances lie, but the real winner will always be the driver, who, regardless of their decision, will walk away with a capable truck. But… we can’t feel good about complimenting the blue oval without pointing out a few unique advantages of the 2018 Chevrolet Silverado. Saving weight is an honourable endeavour – everyone looks great and performs well when they’ve lost a few pounds, and Ford has certainly taken that to the next level with their stamped aluminum, rivet bonded pickup box construction method. But, and this is a big but for pickup drivers – stamped aluminum is nowhere near as strong or as durable as good old fashioned steel. The 2018 Silverado uses the best of both worlds to create a hybridized steel/aluminum relationship that saves weight where it can, and uses the rigidity and strength of steel where its needed most. 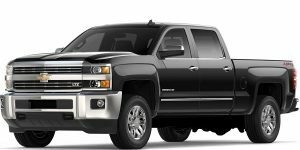 The roll-formed high-strength welded steel box construction of the Silverado is vastly superior in terms of strength and durability. Both pickups are very intricate combinations of rugged grunt and refined comfort. While the Ford makes great use of upscale materials and innovative tech features, it pales in comparison to the standard technology features and innovative signature accents offered in the Chev. The 2018 Silverado offers standard HID headlamps with LED signature lighting, standard CornerStep rear bumper, standard 4G LTE Wi-Fi connectivity, and a standard 8-inch touch screen infotainment system – all but the available 8-inch touch screen are unavailable in the Ford, with the ladder being an added extra. What’s a truck without the grit to put in an honest day’s work? While both American bred pickups are no slouch in terms of hauling and towing numbers, the 2018 Silverado is heads and shoulders above the competition. When comparing the 2018 Silverado 1500 Crew Cab LT 4X4 short box with the EcoTec 5.3L V8 against the 2017 Ford F-150 XLT Supercrew 4X4 short box with the standard 5.0L V8, the Chevy dominates with 2,090 pounds of maximum payload versus the Ford’s 953 pound max payload stats. Another modernized feature that’s a dominating force of the automotive sector, impressive fuel efficiency is a staple requirement of a vehicle – with trucks representing a unique arena where power and fuel efficiency need to find an optimal balance. Power needs to be there when you need it, but fuel economy when you don’t; the Silverado again, makes this section a priority. When comparing the same two models, the Silverado averages 15/10.7 L/100km while the 5.0L Ford brings up the rear, averaging a commendable 15.9/11.3 L/100 km. Trucks need to be there when the going gets tough. For that, dependability and reliability may just be the single greatest trait a modern pickup needs to embody. They’ve got to stand up to every task, and every chore with ease. The Ford is certainly capable of living up to its reputation as a great American workhorse, but the proof is in the pudding when it comes to being able to stand by your convictions. The 2018 Silverado boasts a monumental 5 year/160,000 km warranty, compared to the 5 year/100,000 km warranty of the Ford. When it comes down to reliability, Chevy is able to offer an elongated warranty because the brand has always been dedicated to its reputation as the hardest working trucks on the road. Chevy’s and Ford’s are both great trucks – no rivalry would be worth investigating if a worthy adversary weren’t constantly challenging the status quo. For that, there’s a healthy (and unspoken) respect between the Bowtie crew and their Blue Oval counterparts – but we know which truck we’d rather see in the driveway each morning.